Last October, I went to Prague for 4 days. I had heard many incredible things about the city from friends and family, and still, the city surpassed my expectations. 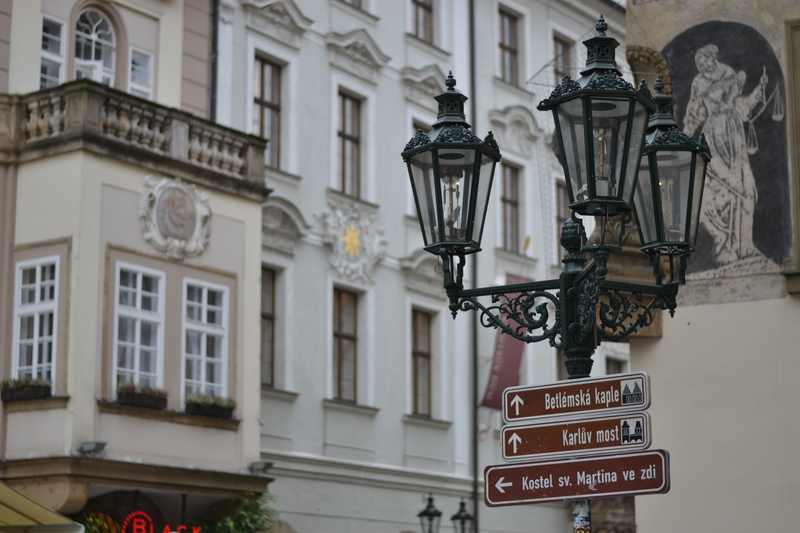 Travel Tips: Walk through the old town and get lost. Even if you don’t plan on getting lost, you may at some point. 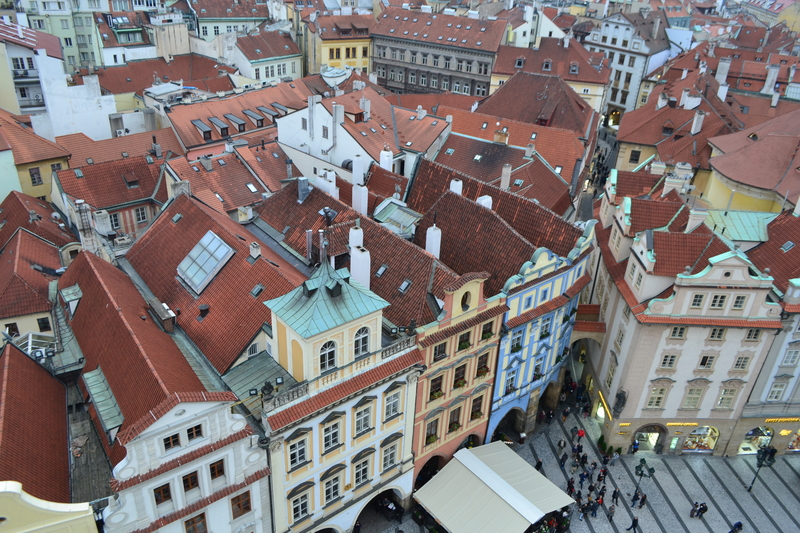 The shot above was taken from the tower above the Prague astronomical clock, and as you can see, hundreds if narrow streets curve, turn and intersect in all sorts of wonderful and surprising directions. We set out for the old town from our AirBnb with a map and after about 10 minutes, we got rid of it. Roads split and merged constantly, so if we had really wanted to pinpoint our exact location, we would have had to have kept our heads in the map at all times. Instead, we decided on the general direction of the old town and walked that way with our heads up to admire the incredible architecture. Above you can see some street signs near the centre of the old down. Hundreds of buildings in this area have beautiful paintings painted onto them. Some of them were done by the Czech artist Alphonse Mucha. If you you’re an Art Nouveau fan as I am, go and visit the Mucha museum in downtown Prague. His drawing skills left me speechless. 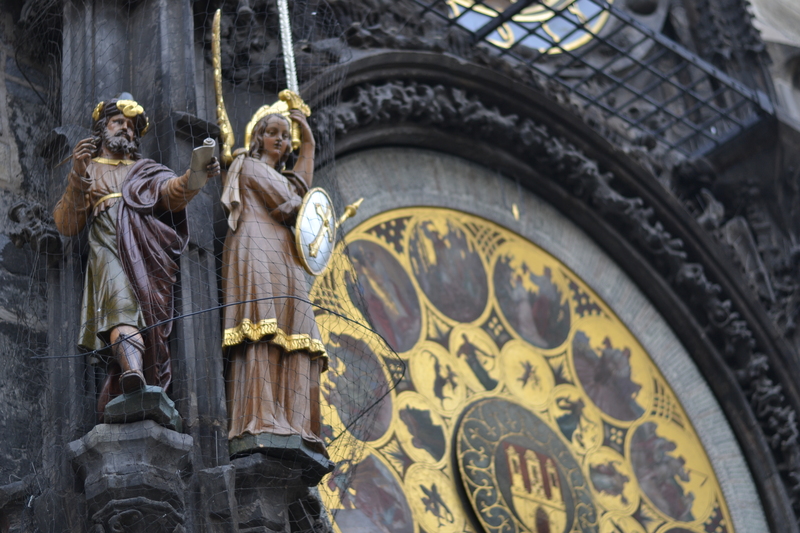 While researching attractions in Prague, I read many posts saying that waiting see the astronomical clock ring and move on the hour was overrated. Since the square would be overcrowded, it would be difficult get a good view, and the whole “show” was quite short. They called it a tourist trap. We ignored the advice and waited in the square for 20 minutes for 13.00. Yes, the square became quite crowded, but this didn’t affect our ability to see the clock since it was quite a few metres up and we all had to look up. Waiting for 13.00 was worth it. Maybe I thought so because I’m a bit of a Medieval history nerd, but there was something humbling about these ancient symbols and figures temporarily coming to life in almost the same way that they had done hundreds of years ago. Most Random Moment of the Trip: Accidentally staring down the European metal band, Epica, as they walked past me after crossing the Charles Bridge. Heading here in May.. can’t wait to explore the city!! Have a great time! It’s an incredible and beautiful city! I wish of going to Prague, its such a beautiful city with a rich history! It really is! I was amazed by the size of the old town. Thank you! Your blog is really awesome too!